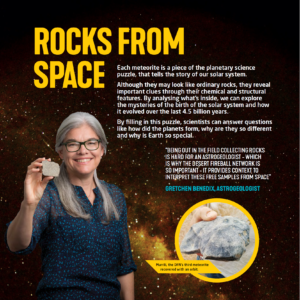 The DFN is a research project aiming to uncover the mysteries surrounding the formation of the solar system through the study of meteorites, fireballs and their pre-Earth orbits. 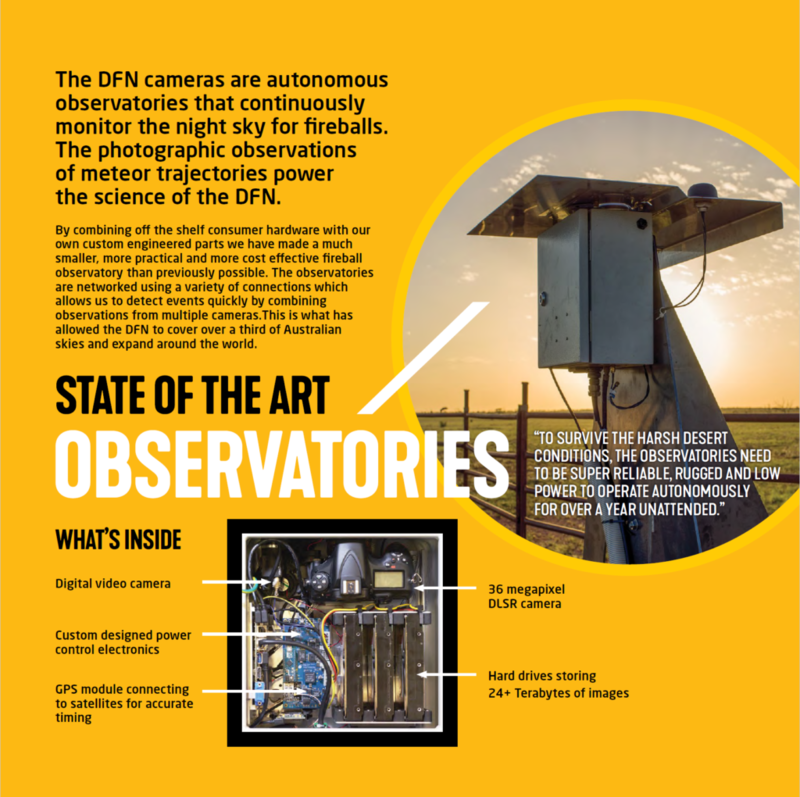 First established in 2005 as a trial of three remote operated film cameras to observe meteors falling towards Earth’s surface, the DFN at Curtin University is now a national distributed network of 52 disruption-tolerant and fully autonomous digital observatories that continually monitor 3 million square km of the night sky – a third of Australian skies, all night, every night. 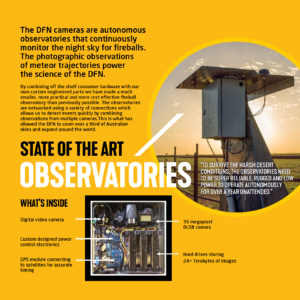 Together with NASA the DFN is expanding to become a Global Fireball Observatory with 40 observatories internationally and a further 150 to be deployed in the next 12 months. Using intelligent imaging systems, automated data reduction pipeline, real time server-side triangulation and supercomputer data management system, the DFN captures the paths of fireballs in the sky, triangulating trajectories from multiple viewpoints, linking the rock’s pre-Earth orbit to its landing site for recovery. Recovering these meteorites help address some of the biggest questions in planetary science: how our planetary system came into being, and how dust and gas produced a planet capable of supporting life – our Earth. Meteorites are the oldest rocks in existence: the only surviving physical record of the formation and evolution of the solar system. They sample hundreds of different objects like asteroids and comet in space. Meteorites can offer a direct route to understanding our origins, but to decode that record we need to know where they come from in the solar system. 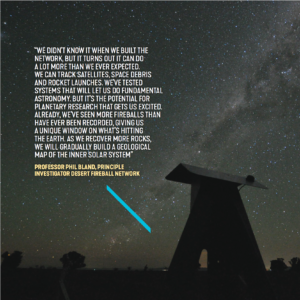 The DFN is world-first research designed to provide that context. Why observe fireballs and study meteorites? Rocky bodies in interplanetary space are of cometary or asteroidal origin. They are on different orbits to the Earth and can occasionally fly right into us. They can be travelling at speeds of up to 72 km a second and when they hit the atmosphere, it’s like someone turned on the brakes – they turn into a ball of fire. Small cometary dust usually burns up and never makes it to the ground. Asteroidal material can be bigger and, if the conditions are right, can survive the atmosphere and land on the ground as a meteorite. Some meteorites also come from larger planetary bodies, such as the Moon and Mars. 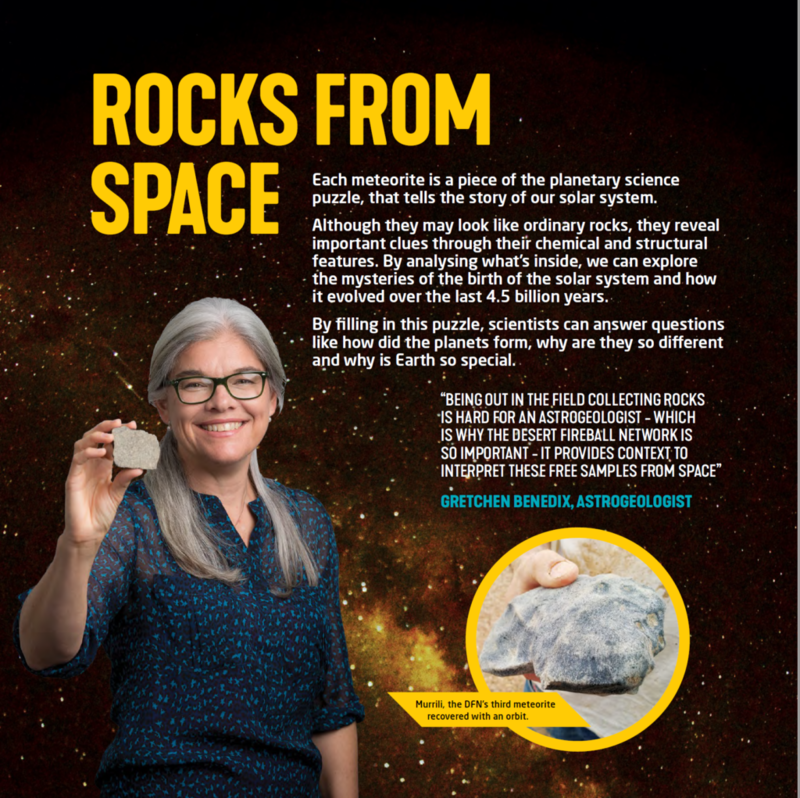 Meteorites are special in that they preserve the histories of their parent bodies, giving us clues to planetary body formation and evolution over the last 4.56 billion years. Highly primitive meteorites contain some of the first solids to have formed in our Solar system and have changed very little since their initial formation. These have been used to date a more precise age of our Solar System (4.568 billion years). 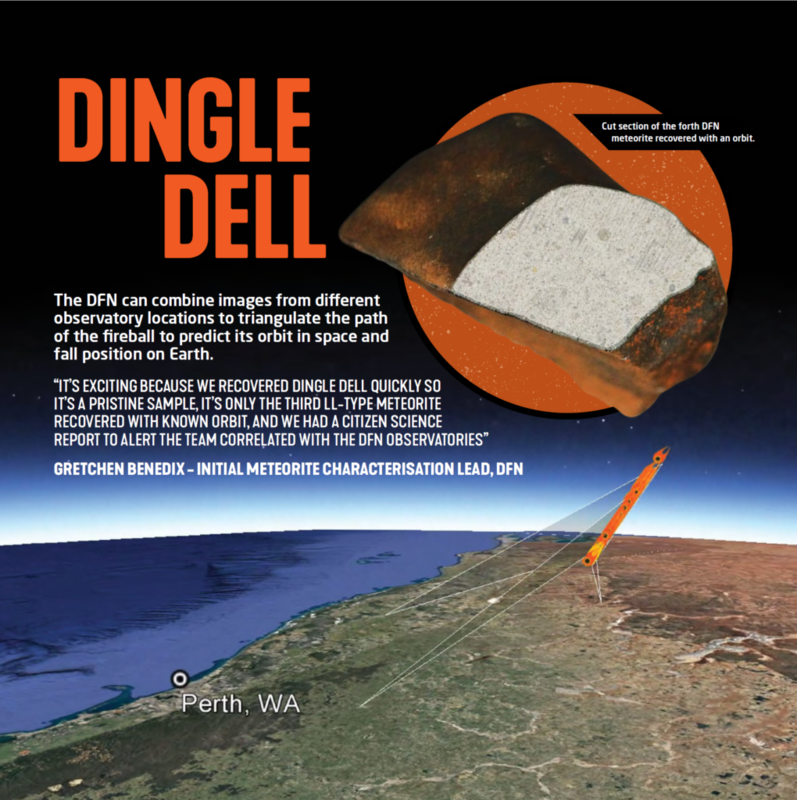 Meteorite falls observed using the DFN observatory helps to inform how a body interacts with the Earth’s atmosphere, how it decelerates, how bright the meteor is depending on the object, and the changes in mass whilst it falls. 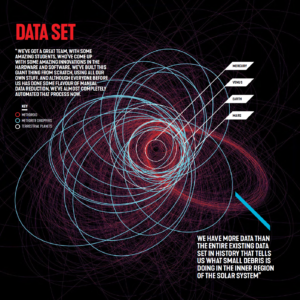 Observing the atmospheric trajectory of these bodies allows us to calculate their orbits and, if a meteorite is recovered, give us the key spacial context to the information it holds. Autonomous camera systems are located across Australia and the world. See the DFN Observatories page for an interactive map with some of our latest images. The DFN observatories use consumer still photographic cameras (specifically DSLRs) with 8mm stereographic fish-eye lenses covering nearly the entire sky from each station. The cameras are controlled via an embedded Linux PC using gPhoto2 and images are archived to multiple hard disk drives for storage until the observatories are visited for maintenance (every 8–18 months depending on the storage capacity). The observatories take one long exposure image every 30 seconds for the entire night. After capture, automated event detection searches the images for fireballs, and events are corroborated on the central server using images from multiple stations. A GNSS syncronised time code is embedded in the long exposure images by the operation of a liquid crystal (LC) shutter to provide absolute timing data for fireball trajectories after triangulation with temporal precision better than one millisecond. Absolute timing is used for the calculation of meteoroid orbits and the relative timing also embedded by the timecode is required for trajectory analysis (specifically to calculate the mass from the deceleration of the meteoroid). The DFN produces ~1.5 petabytes of data per year, which mostly consists of high resolution all-sky images. The rate of data acquisition requires an automated digital pipeline for data reduction. 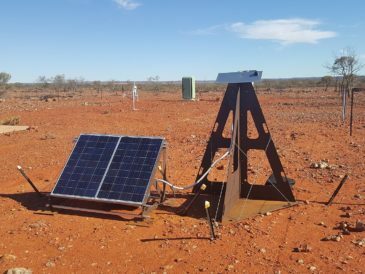 A wireless link to each Automated Desert Fireball Observatory allows a cross-check for multi station confirmation and enables images to be remotely downloaded. Software has been created to facilitate the location of fireball trajectories in pixel coordinates. These are converted to celestial coordinates, to a minute of arc precision, by using a powerful astrometric calibration tool created to automatically identify surrounding stars, and use them as a referencing system. The different observation angles are triangulated using a modified least squares minimisation approach, which now includes weightings based on image quality to produce the full observed trajectory . 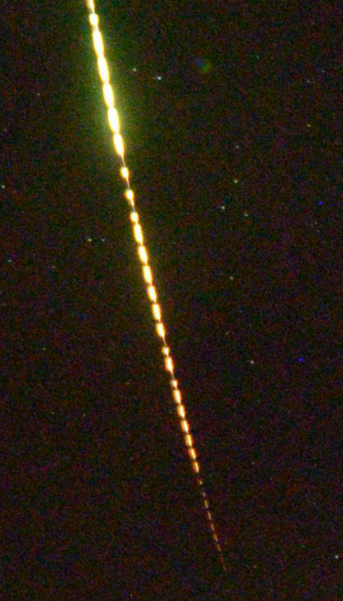 A shutter system within the lens of each observatory encodes a unique non-repeating DeBrujin sequence into each fireball. This provides accurate, absolute timing information for the duration of the trajectory to 0.4 ms. Purpose written software uses entry parameters to determine orbits for each meteoroid. In order to determine if there will be a potential meteorite, the estimation of the changing meteoroid mass is modeled. Once ablation stops, the atmospheric winds strongly affect a meteoroid’s path to the ground. The dark flight trajectory of a meteoroid is significantly affected by the atmospheric winds, especially by the jet stream. As a result, the meteorite fall position can be shifted by up to several kilometers compared to a scenario with no winds.Data from the Global Forecasting System is used in an atmospheric wind model with a 0.008 degree resolution mesh uniquely created around the area of the fireball. A Monte Carlo dark flight simulation is performed to determine a likely search area for main mass and fragments. 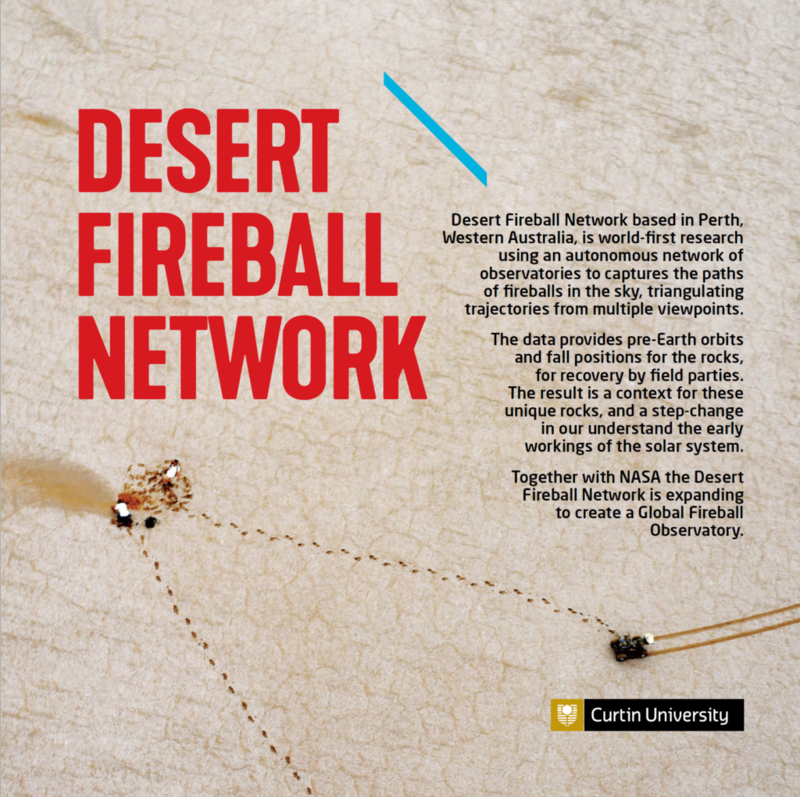 For the primary purpose of this network to recover meteorites, only a small fraction of these data (images containing fireballs) is needed, and is handled by the above data processing pipeline. There are many other potential uses for these data in areas of Astronomy or Space Situational Awareness. 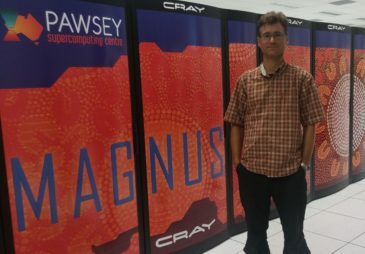 Servicing remote stations is required every 2 years or so to swap hard drives and return all data to Perth to be archived in a data store at the Pawsey Supercomputing centre. The multi-petabyte data store allows searching of the dataset, using generic and project-custom metadata, and data sharing with other research groups. Meteorite fall predictions from a camera network typically produce a “fall line”—a straight or curved line on the ground typically a few km long—where it is believed the meteorite has fallen somewhere along the line, but its precise location is unknown. This is a result of the triangulation process, the effect of atmospheric winds during the fall, and knowledge of the apparent visible deceleration of the meteorite, but a lack of knowledge of its density, shape and precise mass. 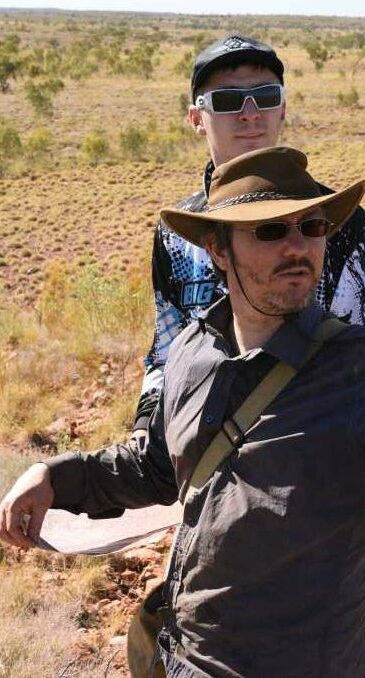 Searching on foot, gridding the area using GPS units to guide walkers, or using survey flags to mark areas, useful for smaller predicted masses, or a smaller error ellipse. This allows detailed coverage of the area with a higher confidence, but less area is searched per unit time. For larger areas, searching using quadbikes or ATVs. This is most applicable for larger predicted falls, or good clear area with good long distance visibility. Current research is focusing on the use of drones as a technique to improve efficiency. 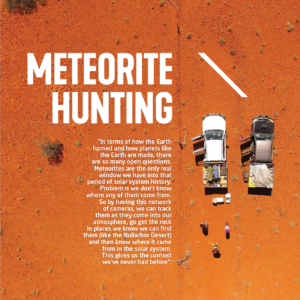 If you are keen to join us on a meteorite searching expedition, send us an email, we’re always keen for enthusiastic volunteers! 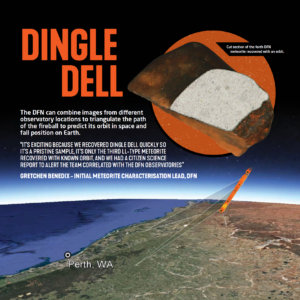 The DFN has recovered four meteorites with highly accurate trajectory and orbital data so far. The two more recent recoveries, Murrili and Dingle Dell, were collected within a very short timeframe following the observed fall, meaning the digital progression of the network pipeline is becoming more and more effective as time progresses. A research and development partnership between Lockheed Martin Space and Curtin University has innovatively harnessed technology previously used to observe meteorite fireballs, and has applied it to track satellites. 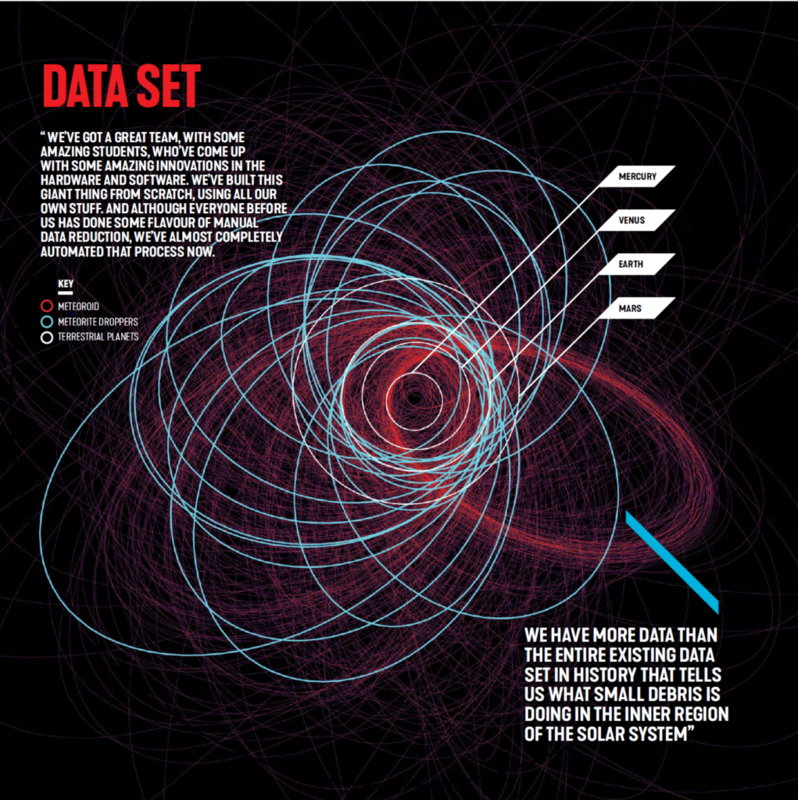 At a fraction of the cost of current technologies, the system has the potential to radically disrupt the way space objects in orbit will be tracked. The FireOPAL project uses a range of sensors to track satellites and space debris which will ultimately provide a persistent view of objects in orbit around the Earth. It will also provide an early warning system of potential problems affecting satellites and their interaction with the thousands of pieces of space debris. 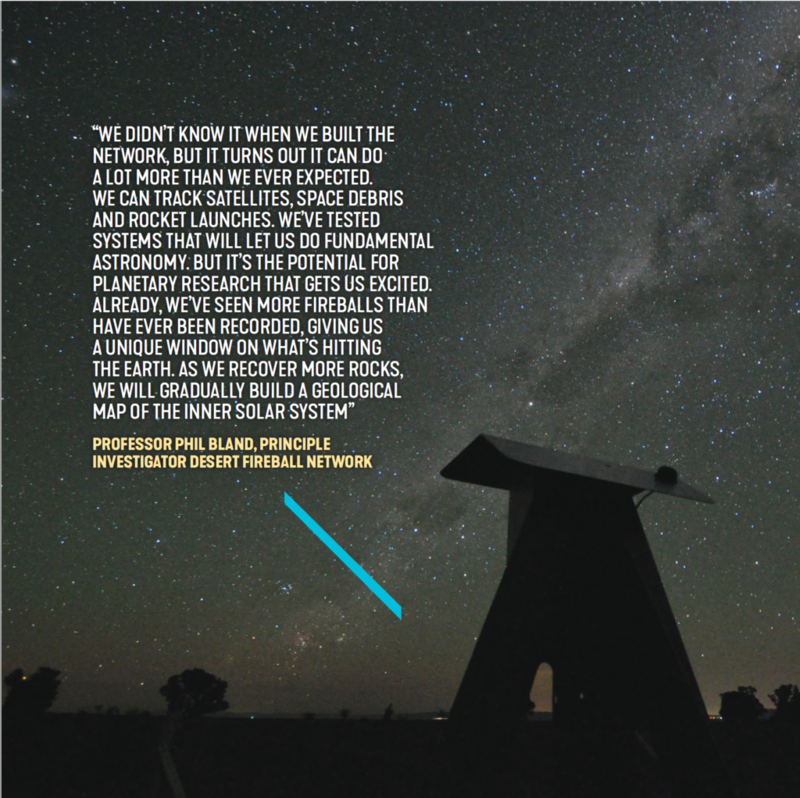 The system is an adaptation of our current DFN meteorite tracking capability. Managing Director – Australia and New Zealand, Lockheed Martin Space, Rod Drury, said FireOPAL is an entirely Australian innovation developed by Lockheed Martin and Curtin University that is set to be expanded around the world. “This technology enables us to track objects in space in a way that hasn’t been done before,” Mr Drury said. “We are trialing more space situational awareness sensors and new capabilities to assess what is possible and explore the advantages and challenges of combining data from different sensors. 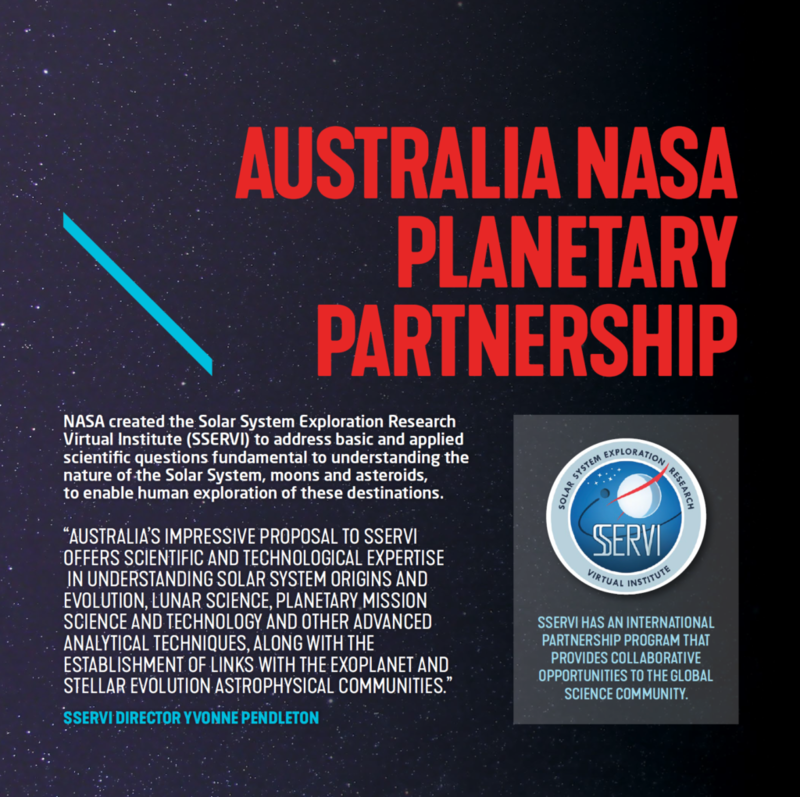 “This partnership with Curtin University further demonstrates Lockheed Martin’s ongoing commitment to collaborating with Australian researchers and industry to identify and develop advanced technologies for the space domain,” Mr Drury said. 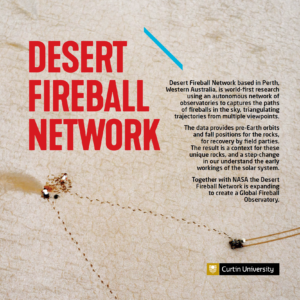 John Curtin Distinguished Professor Professor Phil Bland, leader of the Desert Fireball Network at Curtin University, reinforced the importance of partnerships with companies like Lockheed Martin for continuing to support, improve and potentially further develop Australia’s niche space capabilities. The joint research and development partnership between Lockheed Martin Space and Curtin University was formally announced at the 68th International Astronautical Congress in September 2017.